The financial and economic crises of 2008 have been intimately interwined with the dynamics of debt. As a matter of fact, a research by Ng and Wright (2013) reports that in the last thirty years all the U.S. recessions had financial origins. Figure 1 shows that both U.S. corporate (green line) and mortgage (blue line) debts have been growing steadily from the sixties to the end of the century. In the 2000s, however, mortgage debt increased from around 60% to 100% of GDP in less than a decade. The situation became unsustainable in 2008 with the outburst of the subprime real asset bubble. The trend in debt changed since then. 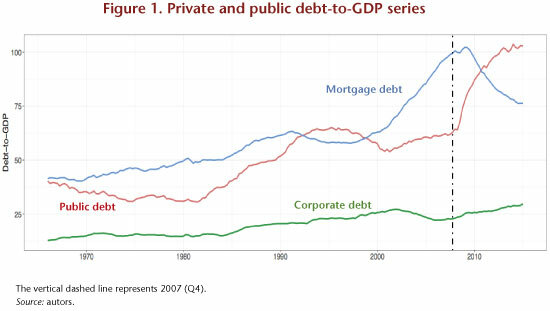 Mortgage debt declined substantially, while the U.S. public debt-to-GDP ratio (red line) skyrocketed from 60% to a level slightly above than 100% in less than 5 years, as a consequence of the Great Recession. This surge in public debt has been raising concerns about the sustainability of public finances, and more generally, about the possible detrimental effects of public debt on economic growth. Some economists argued indeed that there exist a 90% threshold after which public debt harms GDP growth (see Reinhart and Rogoff, 2010). Notwithstanding a large number of empirical studies contradicting this hypothesis (see Herdon et al., 2013 and Égert, 2015 as recent prominent examples), the debate is still open (see Ash et al., 2017 and Chudik et al., 2017). We have contributed to this debate with a new empirical analysis that jointly investigates the impact of public and private debt on U.S. GDP dynamics and that will appear on “Macroeconomic Dynamics” (see Guerini et al., 2017). Our analysis keeps the a priori theoretical assumptions as minimal as possible by exploiting new statistical techniques that identify causal structures from the data under quite general conditions. In particular, we employ a causal search algorithm based on the Independent Component Analysis (ICA) to identify the structural form of the cointegrated VAR and to solve the double causality issue. This has allowed us to keep an “agnostic” perspective in the econometric analysis, avoiding restrictions on the model, thus “letting the data speak”. The results obtained suggest that public debt shocks positively and persistently affect output (see Figure 2, left panel). In particular, our results provide evidence against the hypothesis that upsurges in public debt hamper GDP growth in the U.S. In fact, increases in public debt—possibly channeled through an increase in public spending in investments—crowd-in private investments, (see Figure 2, right panel) confirming some results already brought to the fore by Stiglitz (2012). This implies that government spending and, more generally, expansionary fiscal policy spur output both in the short- and in the medium-run. In that, austerity policies do not seem to be the appropriate policy answer to overcome a crisis. On the contrary, these positive effects are not fully observed when we look at the effects of private debt and in particular when we focus on mortgage debt. More specifically, we find that the positive effects of private debt shocks are milder than public debt’s ones, and they fade out over time. Furthermore, increasing the levels of mortgage debt have a negative impact on output and consumption dynamics in the medium-run (see Figure 3), while their positive effects are only temporary and relatively mild. Such a result appears to be fully consistent with the results of Mian and Sufi (2009) and Jordà et al. (2014): mortgage debt fuels real asset bubbles, but when these bubbles burst, they trigger a financial crises that visibly transmit their negative effects to the real economic system for longer periods of time. Another interesting fact that emerges from our research, is that the other most important form of private debt—i.e. non-financial corporations (NFCs) debt—does not generate negative medium-run impacts. As a matter of fact (as it is possible to see in Figure 4) surges in the level of NFCs debt seems to have a positive effect both on GDP and on gross fixed capital formation, hence directly increasing the level of investments. To conclude, our results suggest that debt has a Janus-faced nature: different types of debts impact differently on aggregate macroeconomic dynamics. In particular, possible threats to medium- and long-run output growth do not come from government debt (which might well be a consequence of a crisis), but rather from increasing too much the level of private one. More specifically, surges in the level of mortgage debt appear to be much more dangerous than the building up of corporate debt. For details about the ICA algorithm see Moneta et al. (2013); for details about its statistical properties see Gourieroux et al. (2017). When computing the Impulse Response Functions, we apply a 1 standard deviation (SD) shock to the relevant debt variable. Hence, for example, on the y-axis of Figure 2, left panel, we can read that a 1 SD shock to public debt has a 0.5% positive effect on GDP in the medium run. ← France’s RSA income support: 35% lack of take-up?